AUSTIN, TEX. — Even if you try to look past the eight-metre-high chain-link fence, beyond the scores of uniformed guards patrolling the perimeter and away from the cameras, metal detectors and lasers, there isn't the slightest evidence of children inside the T. Don Hutto Family Detention Center. No one is playing outside; there are no sounds of laughter. But inside the thick, whitewashed walls of this former maximum-security prison in the heart of Texas are about 170 children — including a nine-year-old Canadian boy named Kevin. Call it international limbo. Detained by U.S. Customs officials after their flight to Toronto made an unscheduled stop on American soil nearly four weeks ago, Kevin and his Iranian parents, Majid and Masomeh, feel they are being held hostage not only by the physical parameters of Hutto, but by the politics of nationality. 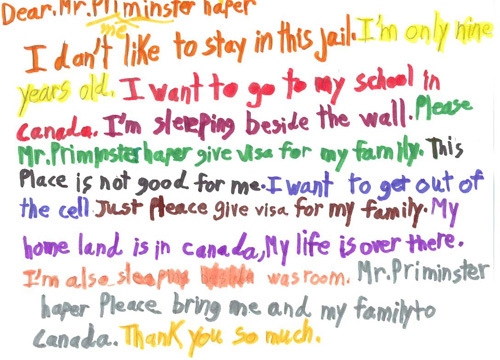 “We can't go home because I am Canadian but my parents are not,” Kevin said in a telephone interview with The Globe and Mail — no personal interviews have been granted. Majid and Masomeh — they prefer their last name not be used — initially fled Iran for Canada in January, 1995, to seek political asylum. Majid did odd jobs, eventually becoming manager of an east Toronto pizza parlour, paying the rent for their one-bedroom apartment. In 1997, their only son, Kevin, was born. “For the first time, I was happy,” Majid said from the Hutto detention facility. Kevin attended a Toronto school until Grade 3. Meanwhile, his parents were seeking refugee status, based on fear of persecution in Iran, but their application was denied and, in December, 2005, the family of three was deported. Upon their arrival in Tehran, Majid said he was taken away from his family to a prison cell. For three months, he was detained, beaten and tortured, he said. When he was released, the three were reunited, and, with the help of friends and relatives, they connected with a people smuggler in Tehran. Carrying Greek passports — which do not require visas for entry into Canada — they travelled to Guyana, where they eventually boarded a Toronto-bound plane. Lorne Waldman, an immigration lawyer in Toronto, said that because of the heightened security measures put in place after Sept. 11, 2001, people smugglers have found alternate routes to get into Canada. It was that belief that got Kevin and his parents onto a Zoom Airlines chartered, non-stop flight from Georgetown to Toronto. A woman had suffered a heart attack and died on board. After landing in Puerto Rico, everyone was told to disembark while emergency crew removed the body. After being held in Puerto Rico for five days, the family was brought to Taylor, Tex., about 45 kilometres northeast of Austin, to the main U.S. family detention centre for immigrants. Now, the three of them are locked inside the centre that, U.S. refugee advocates recently alleged, features inadequate medical care, lack of privacy and abusive behaviour by staff toward the green-uniformed detainees. Everyone must wake up by 5:30 a.m. to take showers. They get 15 minutes to eat each meal. Everyone must be in bed by 9:30 p.m., when laser-triggered alarms are set to detect if anyone gets up. “The day is very regimented,” said Barbara Hines, a law professor at the University of Texas who runs an immigration clinic with her students — the only way many of the detainees get representation. At one point, Majid walked into the room where Kevin and his mother sleep to help them fix a broken bed. The only other detention facility that holds families is in Pennsylvania, she said — but that used to be a nursing home, not a prison. “No amount of softening it [Hutto] up, as the government says, is going to change the fact that this is a secure prison facility, not a family residential centre,” she said. But an official at Immigration and Customs Enforcement, Jamie Zuieback, said the “residential, non-secure setting at Hutto” was opened in May to keep families together. Kevin, meanwhile, has lost six pounds in the past two weeks because he hasn't been eating, his father said. Nearly all of the meals come from cans, Kevin complained. Kevin goes to school for four hours a day, of which only one is instructional. He said that since he left Toronto, he hasn't gone to a real school. “My biggest wish is to go to Canada and be free, to go to my school, go for my books,” Kevin said, his father's voice audible in the background. David Marshall, a consulate spokesman, said that he could not talk about the case, citing the Privacy Act. Alain Cacchione, a spokesman for Foreign Affairs Canada, would not comment either. But Audrey Macklin, a professor of immigration at the University of Toronto, said that this case highlights the asymmetry of Canadian citizenship. She said that if the Canadian government wanted to protect Kevin, it could. Above all else, Kevin, Majid and Masomeh say they want to live in Canada.